A Golden Globe Award winner for Best Picture, Toy Story 2 has become a favorite all across the world, garnering praise from fans and critics everywhere. It's "an instant classic," raves "New York Magazine". Now, in a 2-disc collector's edition with a sparkling theater mix, this groundbreaking animated adventure is even better! While Andy is away at summer camp, Woody is toynapped by Al, a greedy collector who needs Andy's favorite toy to complete his Roundup Gang collection. Together with Jessie, Bullseye, and the Prospector, Woody is on his way to a museum where he'll spend the rest of his life behind glass. It's up to Buzz, Mr. Potato Head, Hamm, Rex, and Slinky Dog to rescue their friend and remind him what being a toy is all about. Bursting with exclusive bonus features, including deleted scenes, outtakes, a new game, and much more, this hilarious comedy classic raises the bar on family entertainment to infinity and beyond. $57.388 million on 3236 screens. Prior to Toy Story 2's November 1999 debut, Disney had only ever released one theatrical sequel: 1990's The Rescuers Down Under. That film didn't exactly set the box office on fire, and since that time, most of Disney's animated sequels had gone the "direct to video" (DTV) route in the US. This pattern doesn't necessarily mean that the movies wouldn't be any good, but the truth is that few of the ones I've seen have offered much fun or entertainment. From what I've heard, TS2 was initially slated for DTV release, but when the big-wigs at Disney saw what fine work the folks at Pixar were doing with the movie, they altered their decision. As such, TS2 got a full theatrical release and justified the change through its terrific success at the box office. The movie grossed a whopping $245 million, which made it the third biggest moneymaker of 1999 after The Phantom Menace and The Sixth Sense). Of course, money isn't everything, but TS2 wasn't some brain-dead piece of populist fluff that raked in the bucks and displayed no signs of creativity or flair. In fact, TS2 easily qualified as one of the best movies of 1999 and belongs to a small list of sequels that arguably was better than the original. Frankly, I think that to determine the superior film would require a coin flip. Both are absolutely excellent and any distinction I would make between them would be arbitrary. Really, all of the praise I heaped upon Toy Story applies to its sequel. Both films are cut from the same cloth and feature identical strengths. However, don't mistake that statement to mean that the sequel is a carbon copy of the first - it's not. Instead, it capitalizes on what made the original so great but also creates a feel and charm all its own. TS2 neatly stands alone and functions as a terrific movie in its own right. All of the original voice cast returns, which must have been a difficult feat. For one, although both Tom Hanks and Tim Allen were successful when they made the first film, their prominence escalated considerably in the intervening years, especially in the case of Hanks. When the production of Toy Story started, he was just a star, but by the time it appeared in November 1995, he was a two-time Oscar winner who headlined the prior year’s biggest hit. Accolades like that tend to cause salaries to escalate, and while I don't know the fees acquired by Hanks or any of the rest of the cast, I'd assume everyone took home a nice little - or big – raise for TS2. Actually, no matter what they did during the four years between films, it was likely that everyone would get more money just because of the original movie's financial success. That gave everyone a nice little bargaining chip, and I have to believe TS2 required a much higher budget than did the first picture. Toy Story 2 is truly a movie that has it all. It's funny, it's exciting, it's clever, it's intelligent, it's warm, and it's moving. While I can't honestly decide if I prefer it to the original, I do think it's a more "complete" film just because it covers a greater spectrum of emotions. Toy Story had some moments that were slightly touching, but TS2 goes farther in this regard as it better explores the depth of personal connections. When we see the musical montage that shows Jessie's relationship with her former owner Emily, it's next to impossible not to get choked up by the tone. I don’t care for Sarah McLachlan, but even I got a lump in my throat as the sad visuals passed along with the strains of her rendition of Randy Newman's "When She Loved Me" - it's a truly touching sequence. TS2 clearly doesn't try to reinvent the wheel, and the film's structure seems quite similar to that of the initial film. Both movies progress at an equivalent pace and deal with related issues, and their climaxes are both deliriously hectic and exciting. Even some of the songs seem fairly close; "When She Loved Me" stands in as a better version of the first movie's "I Will Go Sailing No More". I wouldn't call TS2 a remake of the original, but there's not a lot of real differences. So how come TS2 seems so incredibly fresh and invigorating? If the two were as alike as they appear to be on the surface, I'd expect to feel let down by TS2, especially due to the circumstances under which I watched the DVDs. I viewed both films back to back, starting with the first movie, so all of the similarities should have been magnified. But that never became a concern. In fact, the proximity of the screenings made the related nature of the two movies feel like a positive, strangely enough. It was easier to detect the references to the original when I watched TS2, and I could see the wonderful ways the filmmakers improved upon the first picture. My opinions of the creative similarities and differences remain up in the air. My final decision remains that I love them both and could never choose. However, the back to back viewings did accentuate one significant improvement found in TS2: the animation. When I saw the film theatrically, I thought the visuals seemed pretty close to those found in the original movie. I didn't believe there were any huge changes in the work we saw. However, when you check out the two films in close proximity, it becomes much more obvious just how much better the art for TS2 appears. The characters still look essentially the same - obviously Pixar couldn't alter the basic look of the toys or continuing humans - but they all display more fluent and realistic movement and more subtly executed actions. There's a lot more depth to the animation. We also see vastly improved detail within some of the new characters. For example, compare Scud in Toy Story to Buster in TS2; the latter offers a radically more realistic depiction of a dog. Actually, the subject of "realism" reminds me of the one gripe I have with TS2: it's somewhat inaccurate depiction of the status of collector's items. As part of the plot, a toy collector who apparently has long searched for one of those dolls steals Woody. The thief has a complete collection of Woody memorabilia except for the Sheriff himself. This seems extremely unlikely. We're led to believe that Woody starred in a hugely successful late-Fifties TV show and that masses of Woody's Roundup merchandise appeared. If this is the case, Woody himself should have been the easiest doll to find, not the hardest, There'd be many more of him in circulation than any of the others. But I'm picking nits, especially when one considers I'm willing to accept a world in which a piggy bank drives a car. Frankly, this illogic is probably the biggest flaw I could find with Toy Story 2. It's a thoroughly delightful film that lives up to the original in every way and just might improve upon it. The movie should work wonderfully for both adults and kids and actually improves upon repeated viewings. Toy Story 2 is an absolute gem. 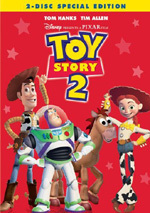 Toy Story 2 appears in an aspect ratio of approximately 1.77:1 on this single-sided, double-layered DVD; the image has been enhanced for 16X9 televisions. Can it get any better than this? Maybe, but it's hard to imagine - TS2 presented an absolutely fantastic picture. Sharpness appeared flawless throughout the film. The movie always seemed perfectly crisp and detailed with no signs whatsoever of any softness or haziness to be found. I also detected no signs of moiré effects or jagged edges, and edge enhancement seemed absent. As with the original Toy Story, this transfer came from the actual computer data. Because of this, it didn't have any flaws since no print was ever used, and the result was a tremendously clean and fresh image. TS2 used a varied palette, and the colors came through with exquisite richness and boldness. From start to finish, all of the hues seemed gorgeous. From the lovely red of Jessie's hair to the warm browns of Woody's clothes to the sumptuous purples of Zurg's body, the whole magilla looked great. At no point did I discern any problems related to colors; they appeared absolutely scintillating. Black levels also were deep and dense. They offered no signs of murky or muddy qualities, and I also saw excellent contrast. Shadow detail appeared clear and appropriately opaque throughout all of the related scenes. Best of the bunch were the shots in Al's apartment at night. Just the flickering light of a TV illuminated these and they presented excellent depth throughout the dimly lit scene. All in all, TS2 offered a tremendously fine image that showed virtually no complications. When we moved to the audio, we found a similarly terrific experience. 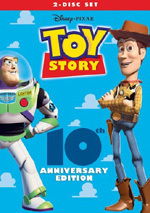 This new Toy Story 2 DVD offered both Dolby Digital 5.1 EX and DTS 5.1 ES soundtracks. Both were pretty similar, but I preferred the DTS edition. I’ll discuss the Dolby one first and then relate why I liked the DTS take just a little bit more. The mix for the first film was also quite good, but it had a few weaknesses. All of those have been rectified here, however. The soundfield seemed very broad and engaging. For the most part, the forward spectrum dominated, but the entire package was well-distributed and nicely balanced. It's a pretty seamless mix that spread the audio cleanly between the various channels. Effects and music often emanated from all five speakers, and the sound blended together neatly so that the environment seemed smooth and convincing. Various auditory elements appeared precisely located in the spectrum. Even dialogue was focused in the correct locations across the front speakers, and we also heard some speech from the rear when appropriate. The surrounds contributed excellent reinforcement of the information and also used split-channel details quite effectively. Best of the bunch was probably the scene in which Buzz and the gang had to cross a busy street. The sound flew fast and furious and really engulfed the viewer in the action. Equally solid was the quality of the audio. Some of the dialogue in the original movie came across as edgy and brittle, but that didn't occur here. All of the speech in TS2 appeared warm and natural, with no signs of shrillness or concerns related to intelligibility. Music sounded clear and smooth, with terrific range. The various songs were wonderfully rich and lush - especially the lovely "When She Loved Me" - and the score seemed appropriately brassy and bright. Effects were the best part of the package. They appeared very accurate and realistic and showed absolutely no signs of distortion or harshness. The track boasted fine resolution and terrific depth; this movie offered some excellent bass. The aforementioned street-crossing scene provided one strong example, as did the segments in the apartment building vents and its elevator. Even Al's indigestion appeared deep and rich! Overall, it's a wonderful mix that barely missed out on an "A+" rating. I felt that the audio lacked the "wow!" factor that I require of films that qualify for the "A+", but it's such a smooth and well-integrated soundtrack that I considered that ultimate grade. The DTS mix improved on the Dolby one just enough to qualify for the “A+”. You’ll find many similarities between the two, but I thought the DTS version was even smoother and better integrated. The elements combined a smidgen more tightly there and created a fine sense of location. The elements also packed a wee bit more punch, with firmer bass and a greater dynamic impression. I loved the DTS mix and felt it was stellar from start to finish. How did the picture and sound of this version compare to the original DVD from 2000? I thought both offered virtually identical visuals, but because the 2005 edition included the DTS track, it presented the superior auditory experience. The old disc offered the same Dolby Digital mix found here. It’s excellent, but because I prefer the DTS track, this DVD gets the nod for movie presentation. Since the Ultimate Toy Box came chock full of extras, fans will want to find out what’s different about the supplements in this 2-disc special edition. Answer: not much. I’ll denote any new elements with an asterisk, so if you don’t see a star, that means the component already appeared on the 2000 release. Starting on DVD One, we get an *Introduction with director John Lasseter. In this 92-second piece, Lasseter tells us a little about the film and makes some jokes. It doesn’t seem particularly valuable, but it’s a cute addition. 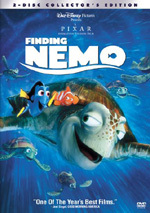 Next we get an audio commentary with Lasseter, co-writer Andrew Stanton, and co-directors Lee Unkrich and Ash Brannon. All four sit together for this running, screen-specific discussion. And a fine one it is, as they touch on many things connected to the film. We get many notes about the story and various inspirations. We also learn about the new characters and their development as well as growth in the old ones. The crew toss out info about visual design, different gags and references, challenges related to a sequel, music, audio effects, and their interaction, technical areas and the work of the cast. For another alternate audio experience, we get a special effects mix. This isolates the movie's effects for us in Dolby Digital 5.1 sound. I'd prefer an isolated dialogue program, but this one's pretty cool anyway. It's fun to check out the killer "street crossing" scene with just the effects on display. The DVD opens with some ads. We get promos for Cars, Lady and the Tramp, and Chicken Little. These also appear in the *Sneak Peeks domain along with previews for The Little Mermaid, Bambi II, Toy Story, and the Incredibles: The Rise of the Underminer video game. Finally, DVD One features the THX Optimizer. Also found on many other DVDs, this purports to help you set up your system for the best reproduction of both picture and sound, ala stand-alone programs such as Video Essentials. I’ve never tried the Optimizer since I’m happy with my settings, but if you don’t own something such as Essentials, the Optimizer may help you improve picture and audio quality. When we move to DVD Two, we get a large collection of extras. We open in an area called the “Toy Box”. This launches with both sets of Outtakes that appeared during the movie's theatrical run. As with A Bug's Life, the film added some faux-bloopers during the end credits, and both pictures also had two separate sets of clips; one appeared when the film first hit screens, and the second replaced the first after a few weeks in theaters. Unlike the Bug's Life DVD, none of the outtakes can be found during the presentation of the movie itself. Instead, they're all shown fullscreen and they run for a total of five minutes and 27 seconds. Personally, I think this concept is getting a bit tired. The first batch in Bug’s Life was fun because it so neatly lampooned the lame bloopers that we sometimes find added to movies. At this point, they're losing their wickedly mocking tone and are becoming more ordinary. Still, they're kind of fun and deserve a look. Who's the Coolest Toy? is a cute but insubstantial piece in which a slew of participants debate the topic. 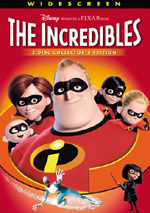 We find interview clips with Lasseter, actors Tom Hanks, Tim Allen, John Ratzenberger, Joe Ranft, Joan Cusack, R. Lee Ermey, Jodi Benson, Don Rickles and Wayne Knight, musicians Sarah McLachlan and Riders in the Sky, Pixar chief Steve Jobs and producers Karen Robert Jackson and Helene Plotkin. in this three-minute and 17-second program. A new game called *Which Toy Are You? comes hosted by Hamm and Rex. This asks a number of questions and then tells you which character you most closely resemble. (I’m Hamm, by the way.) It’s more fun than most of these, a factor aided by the use of Wallace Shawn and John Ratzenberger as the voices. It even has replay value, as you’ll get different questions each time. The feature with the oddest title, *Ponkickies comes from a Japanese kiddie show. It allows you to play “Rock, Paper, Scissors” with Woody, Jessie and Buzz. It shows a few animated clips, all performed in Japanese. If nothing else, this is a darned weird segment. We find a three-minute and 10-second Riders In the Sky Music Medley. Riders In the Sky play an amalgam of tunes. In addition to the "Woody's Roundup" theme, it tosses in bits of "Act Naturally", "You've Got a Friend in Me" and other songs. The video is a pretty standard affair that combines lip-synch shots of RITS with scenes from the film. The “Toy Box” ends with Autographed Pictures. It shows 18 publicity photos with phony signatures of the toys. (Not that I suppose you could have real signatures from them.) The DVD presents it in a filmed manner that lasts 45 seconds. Making Toy Story 2 fills eight minutes and 13 seconds. It features notes from Lasseter, Unkrich, Stanton, Brannon, supervising animator Glenn McQueen, technical director Oren Jacobs, and Disney executive Thomas Schumacher. We get details about the origins of the sequel, influences and the story, themes, and a few technical notes. A few good notes pop up here, but the show stays a little too general to be terribly valuable. That’s especially true since we already know so much from the commentary. With that we move to Deleted Scenes. This area starts with a 47-second "Introduction" from co-director Brannon that sets up the two scenes to follow. "Crossing the Road" exists in the final film, but the version here places in an alternate location; during the one minute and 53 second clip, we see the toys cross a suburban street, not the urban one we eventually witnessed in the completed movie. "Godzilla Rex" lasts one minute and 25 seconds and was originally to be the way that Woody would end up in the garage sale. While I agree that the scene in the final film worked better, this is still a funny segment that I enjoyed. The remainder of the DVD’s components show up in the “Behind the Scenes” area. A John Lasseter Profile provides clips from Hanks, Unkrich, Allen, Rickles, Disney executives Peter Schneider and Thomas Schumacher, actor Kelsey Grammer, producers Jackson and Plotkin, composer Randy Newman, Pixar chairman Jobs, singer McLachlan, actress Estelle Harris and Lasseter himself in this testimonial to his wonderfulness. Somehow, the three-minute and three-second program manages not to appear self-serving and sappy. Cast of Characters offers a discussion of the various roles and the entire voice recording process from Schneider, Lasseter, Hanks, Allen, Rickles, Harris, Knight, Schumacher, Cusack, and Grammer. We also see some good shots from the recording sessions in this three-minute and 29-second piece. I was interested to note that unlike the usual process, Allen and Hanks apparently worked together at times, as did both Harris and Rickles. In the “Design” category, we start with “Characters”. Six Galleries offer drawings in filmed collections. These present “Woody” (48 sketches, one minute, 52 seconds), “Buzz” (53, 2:03), “Andy’s Toys” (55, 2:09), “Woody’s Roundup” (80, 3:07), “Zurg” (25, 0:59), and “Al” (29, 1:10). We also get 3D Turnarounds for “Woody” (0:22), “Buzz” (0:22), “Andy’s Toys” (2:36), “Roundup Gang” (1:06), “Zurg” (0:22), “Al” (0:22) and “Tour Guide Barbie” (0:22). These show the characters as they "spin" for the virtual camera. Continuing in “Design”, we go to “Sets”. Galleries break into "Zurg’s Planet" (23, 0:54), “Andy’s House” (15, 0:36), “Al’s Apartment” (27, 1:03), “Al’s Toy Barn” (43, 1:41) and “Airport” (30, 1:08). More 3D Tours pan around the areas for “Zurg’s Planet” (0:32), “Andy’s Room” (1:04), “Al’s Apartment” (1:04), “Al’s Toy Barn” (2:12) and “Airport” (1:04). These tours come with commentary from production designer Jim Pearson that discusses various elements involved with their design. We also learn how the filmmakers reused old digital props. Jessie's Song starts with a 37-second "Introduction" from Jeup and then provides a three-minute and 22-second "Storyboard to Film" comparison for the "When She Loved Me" scene. The "angle" button again switches between this view and "Storyboards Only". Both components are informative and interesting. Production Tour offers a basic video overview from Lasseter, co-editors Unkrich and David Ian Salter, and co-director Brannon. The two-minute and 31-second program uses a short Buzz and Woody clip from early in the film to demonstrate how thing go from storyboards to the final animation. Production Progression does the same thing but in more detail through a variety of different components. It starts with a 56-second "Introduction" from Lasseter, Stanton, Brannon and Unkrich and then launches into a look at various stages of animation. During this two-minute and 32-second piece, we watch Buzz's arrival at Zurg's fortress go through four stages: "Story Reel"; "Layout"; "Animation"; and "Shaders and Lighting". Yes, your "angle" button will switch between them. Instead of the US-specific materials, the international version featured a globe with fireworks shooting plus a new song by Randy Newman called the "One World Anthem". While I understand the desire to make the film play better overseas, it means that the scene makes no sense. Part of the gag related to the transition between the speech and the TV sign-off, and since no one's ever seen a TV station that showed a globe and fireworks as they left the air, the joke flops. Well, it's still fun to see. With that, we head to “Music & Sound” and its five components. Making the Songs runs three minutes, 25 seconds, and presents notes from Lasseter, composer Newman, Disney executive Schumacher, singer McLachlan, Riders In the Sky, and singer Robert Goulet. We also see some film clips and shots of the recording sessions in this short but fun piece. For the Woody’s Roundup Music Video, we again find Riders In The Sky lip-synching a tune. In this two-minute and 16-second clip, they strum along with the "Woody's Roundup" theme song and we also see a variety of movie scenes. Designing Sound gives us a discussion from sound designer Gary Rydstrom. He focuses on the work done for the epic "street-crossing" scene during this five-minute and 38-second program. Mixing Demo starts with a 25-second introduction from Rydstrom and then lets you mix the segment in the elevator shaft where Buzz confronts Zurg. The 85-second snippet lets you activate dialogue, music and/or effects; you can play each on their own, combine them in various pairs, or play them all at once just like in the final film. It's not real mixing, since you can't alter the volume level of each element, but it's still fun. “Behind the Scenes” concludes with “Publicity”. *Character Interview runs two minutes and five seconds. It presents a session between some slick schmoe and Woody and Buzz. It sounds like Tim Allen does Buzz, but I’m pretty sure another actor portrays Woody. It’s insubstantial but cute. Two trailers fill a total of three minutes and 25 seconds. We get the 60-second "teaser" and the two-minute and 25-second "trailer #1". Interestingly, this clip uses Danny Elfman's music from Men In Black! We also find four TV Commercials, each of which last a little more than 30 seconds. In the Posters area, we locate 20 images. The DVD films them for a 50-second collection. Some nice elements pop up here. Easter Egg time! Highlight the star on the main menu and click “enter”. This allows you to see a 70-second snippet in which Lasseter and Brannon introduce a wacky alternate version of Jessie’s song. It was never intended to be seen, of course, and it’s amusing. For another egg, go to “Publicity” and highlight the star. Hit “enter” to watch a 22-second clip in which Woody throws a baseball at the screen. I have no idea what purpose this clip serves; it’s very odd. A rare sequel that possibly improves on its predecessor, Toy Story 2 is a winner in every way. The movie offers great humor, a fun tale, and real emotion to make it a lively and engaging piece. The DVD presents absolutely excellent picture and audio with a long and informative set of extras. With Toy Story 2, the question doesn’t become if you should own it – the question becomes which version you should own. If you don’t already have a copy of the film, grab this new 2-DVD set. It includes almost all the extras from the prior release and offers a small improvement in audio quality as well. If you already have the “Ultimate Toy Box”, however, it’s a trickier issue. You won’t find any significant new supplements here, as almost everything repeats from the “Box”. I like the 2-DVD set’s DTS track more than the original’s Dolby Digital mix, but not by enough to push a re-purchase. I wouldn’t steer you away from buying this package, but I can’t urge it for folks who have the “Box”. Anyway you look at it, though, this new Toy Story 2 is an excellent release.